When your sister dies, your life is supposed to get worse. But how should you feel if it actually gets a little better? 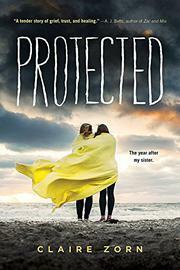 When Katie dies, Hannah is left to navigate high school on her own, without her older sister’s advice and interference. And the torment that has followed the young white woman since freshman year disappears. No one wants to bully the girl whose sister was killed in an accident. But Hannah finds that life at school still isn’t good, and life at home is almost intolerable. Her dad is broken in both body and spirit as he struggles to heal from his own injuries, struggling even more to grapple with the fact that he might be at fault for his daughter’s death. And Hannah’s mother can’t seem to leave the house. Will the family be able to fully recover and stay a family? Zorn treats the issue of bullying with brutal realism, which provides a gritty contrast to the new landscape Hannah finds herself in. Though the book tackles important issues, it reaches far beyond these flash points into a fully developed exploration of the aftermath of tragedy through strong characterization and genuine emotional appeal. Amid loss, depression, and futility, a sense of hope manages to permeate the narrative.